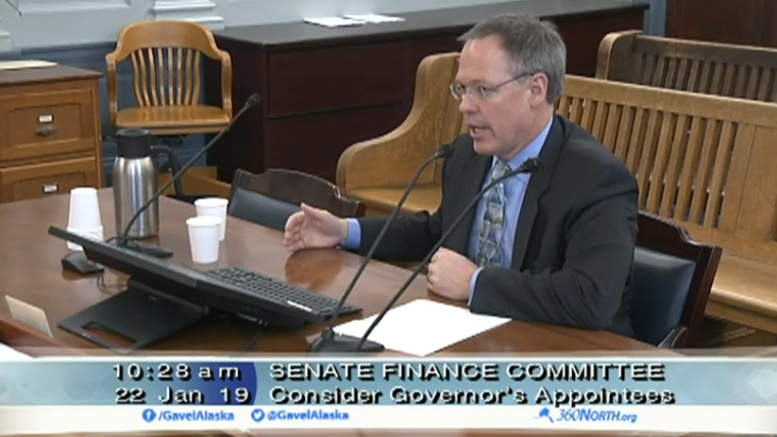 The future of new taxes in Alaska isn’t a matter of “if,” but a matter of “when,” Department of Revenue Commissioner Bruce Tangeman told the Senate Finance Committee during his confirmation hearing today. Tangeman, who’s Gov. Michael J. Dunleavy’s pick to oversee the state’s tax system and finances, told the committee that it’d be “naïve” to assume Alaska can go indefinitely without some sort of additional revenues beyond what it’s currently collecting. He also said there’s zero interest in the administration to re-open a discussion on oil and gas taxes. The answer came during questions about Tangeman’s thoughts on the state’s current financial situation and the use of some portion of the Alaska Permanent Fund to pay for government. Though the Republican governor has yet to submit his budget to the Legislature, his administration has pledged to “match expenditures to revenues,” which has translated into the expectation that $1.6 billion will be cut from the $4.8 billion of undesignated general funds spent on the state’s agency operating budget. So far, any new revenues for this year have been off the table. Tangeman said the cuts made this year are critical to delaying the day additional revenue will be needed. The cost of the full-sized dividend proposed by Dunleavy, a core pledge of his campaign, is $1.9 billion for the 2019 PFD (amounting to about $3,000 for every eligible Alaskan). He’s also proposed supplemental payments for the PFD to make up for reductions in recent years, meaning he’s seeking an additional estimated $683 million to this year’s budget (and $800-plus million asks in the next two). Tangeman added that he’s particularly concerned about the kind of behaviors would change in Alaska with new taxes. He said models can accurately estimate how much revenue a certain tax proposal will bring into the state, but not how it’ll change the fundamental behaviors of the Alaska economy. Asked if the administration would be considering any hikes to fees to bolster revenue, Tangeman said he anticipates that there’ll be such discussion this year. Sen. Donny Olsen, D-Golovin, also asked if there had been any consideration to altering oil taxes. Last week, the committee heard a presentation that new production on the North Slope is many years away. “Your statement is that Alaska is going to have a tax some day—and I assuming you’re talking about an income tax—is there a discussion within the administration about restructuring the petroleum-related taxes that are out there to see if that’s also a revenue stream that could be out there for the state of Alaska?” he asked. As for reopening a discussion on oil and gas taxes, he said it’s a non-starter with the Dunleavy administration. Talk about taxes starts about four minutes into this clip at the timecode 1:26:37. Be the first to comment on "Alaska will need new taxes, but the plan is to delay discussion for ‘many, many years,’ Revenue Commissioner Tangeman tells Alaska Senate"